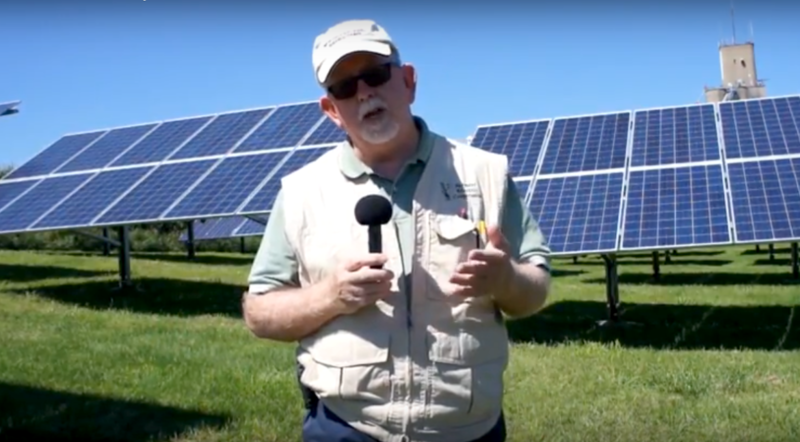 Warren McKenna of Farmers Cooperative in Iowa explains the decision to pursue solar power. Olsen believes there are several compelling reasons to shine the spotlight on rural co-ops that are in the solar-energy vanguard. “Co-ops have an outsized influence on energy policy,” he said. “We’ve experienced that at the state and federal levels. We talk to members of Congress about energy policy and they want to go back and talk to the co-ops. And, Olsen observed, co-ops are better positioned than investor-owned utilities to move forward on renewable energy because they aren’t beholden to maximizing profits, as are investor-owned utilities. They are, however, obliged to respond to the desires of their member-bosses. “We hear often that co-op members want more solar,” Olsen said. The first three co-ops featured on the site include one each from Illinois, Iowa and Wisconsin. Prairie Power Inc., a wholesale cooperative in Illinois that sells power to 10 retail co-ops across central Illinois, installed two 500 kW solar arrays that began producing power about 18 months ago. The distribution co-ops invite their members to sign up for solar power, then purchase the needed amount from Prairie Power. It’s sort of a community-garden project with distribution co-ops as the shareholders. Two considerations drove Prairie Power to do its solar trial: the desires to both reduce its carbon footprint, and to experiment with solar on a small scale. He said the co-op endorses an “all of the above” generation strategy, but still relies primarily on coal and natural gas. About 20 MW of its 330 MW of capacity come from wind. And now, there is 1 MW of solar. The other co-ops featured on the web site have made even larger investments in solar energy. The Dairyland Power Cooperative, a wholesaler based in Wisconsin, is developing 20.5 MW of solar power spread over 15 sites, one of the largest co-op projects nationwide. One array is in eastern Iowa, and the rest are in Wisconsin. Dairyland began considering a solar investment several years ago, and requested proposals in 2016. “What we have come to realize as a board and a management team is that the technology is ripe now and the pricing is right,” said Barb Nick, Dairyland’s president and chief executive officer. And that view has only been reiterated by the decisions of several Dairyland utility customers to add their own solar projects onto Dairyland’s arrays. Distribution co-ops will develop their own community solar projects at nine of Dairyland’s sites, hiking the total energy produced by 1.7 MW. The co-op derives 15 percent of its energy from several solar sources: a 50-kW community solar garden with more than 100 members, 500kW at about 50 homes and businesses in three counties, 52 kW at some school demonstration sites and a 1.7 MW solar farm owned by a solar developer who sells the output to Farmers though a power-purchase agreement. Farmers has achieved its solar goals faster than planned, and isn’t contemplating stopping any time soon.